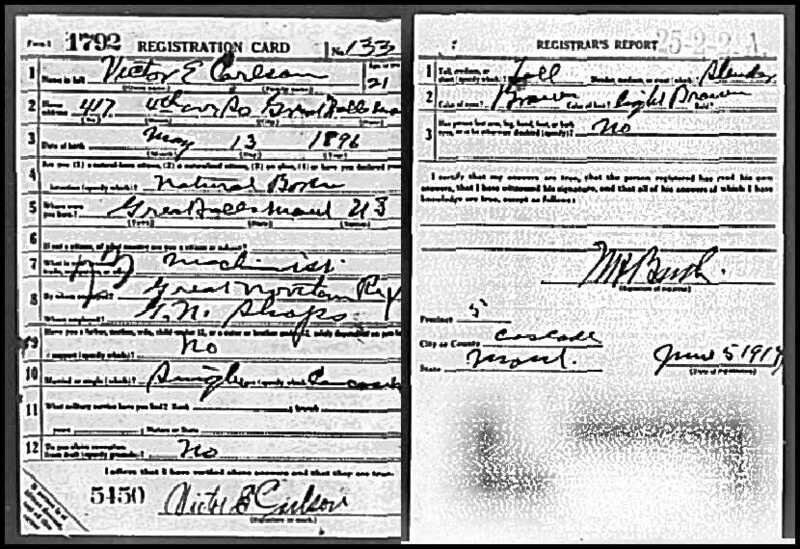 Carlson, Victor, head-of-household, age 23, born in Montana; parents born in Sweden; rented home; occupation: m[..unclear..], railroad. Carlson, Myrtle, wife, age 20, born in Kansas; father born in Ohio; mother born in Canada. Carlson, Milo, son, age 1 year ? months, born in Montana; father born in Montana; mother born in Kansas. Hinshaw, Eva, mother-in-law, age 43, born in Canada; father born in Pennsylvania; mother born in Canada; naturalized citizen; married. Hinshaw, Margret, sister-in-law, age 8, born in Kansas; father born in Ohio; mother born in Canada. Carlson, Victor E., head-of-household, age 33, born in Montana; parents born in Montana; first married at age 22; owned home ($10,500 value); radio in home; occupation: manager, news co.; not a veteran. Carlson, Myrtle M., wife, age 29, born in Montana; parents born in Canada; first married at age 18. Carlson, Milo V., son, age 11, born in Montana; parents born in Montana; attended school. Hinshaw, Eva P., mother-in-law, age 53, born in Canada; parents born in Canada; immigrated 1906; naturalized citizen; widow. Carlson, V.E., head-of-household, age 43, born in Montana; completed 2 years of college; on Apr 1 1935 was living in the same city; rented home ($25/month rent); occupation: manager, news co.; worked 52 weeks in 1939; $1600 income in 1939. Henshaw, Milo, brother-in-law, age 42, born in Nebraska; completed 7th grade; married; on Apr 1 1935 was living in Seattle, Washington; occupation: construction rigger, construction work; worked 12 weeks in 1939; $300 income in 1939. "The Hinshaw Record" by Lyle Harris Hadley, Florida (1965), in the LDS Family History Library, microfilm #0962525, item 10. 1920 census, Great Falls, Cascade County, Montana; roll T625-968, ED 23, page 8B, line #76, dwelling #161, family #198. 1930 census, Dormont, Allegheny County, Pennsylvania; roll T626-1962, ED 567, page 14B, line #79, dwelling #336, family #353. 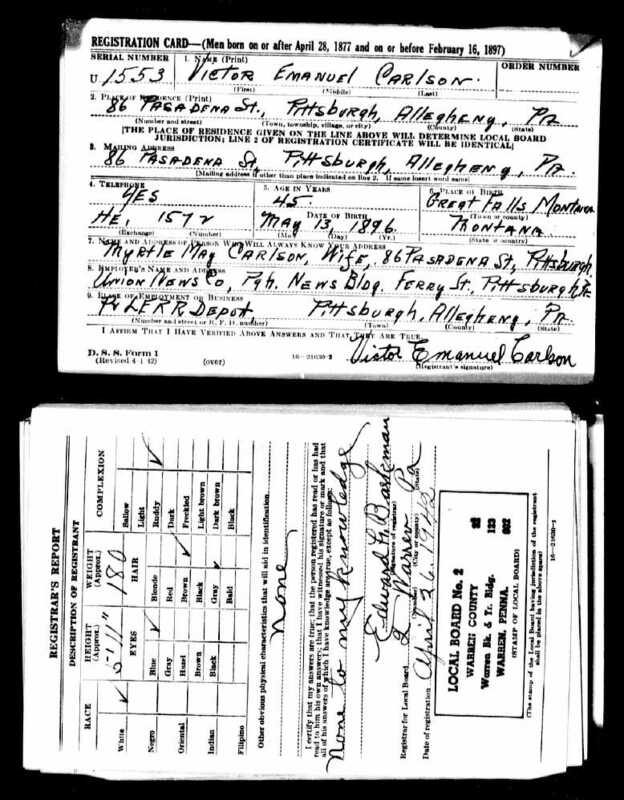 1940 census, Pittsburgh, Allegheny County, Pennsylvania; roll T627-3667, ED 69-514, page 3B, line #58, household #82. Contribution from Teri Cleaveland (). U.S., World War II Draft Registration Cards, 1942; http://www.ancestry,com. Contribution from Abbey Carlson (). Posting Jan 12 2003 by Teri Cleaveland () to PAALLEGH-L.